So we’ve had a few more cooking adventures with our Bellini Super Cook Kitchen Machine, a.k.a. Bellefleur in the past week. After our Hot Wet Rice adventure, I had in my head drawn up completely separate recipes of a goat curry and an amazing sweet potato soup recipe using the Bellini, but we had such a great success with dinner last night, that those two recipes have been parked and we’ll show you how the Bellini can really help in a busy kitchen household. Our Sundays are pretty routine. Wake up, go to church, have brunch, head out to buy groceries and head home to cook. In the kitchen, we usually take turns (as we have a small kitchen) and we both can’t be in it at the same time. I use the kitchen mostly for home-cooking and to bake, whilst The Boy uses it for his mad creation skills in plating up fine dining dishes. When The Boy has the command of the kitchen, I usually find myself pottering around the house or taking a nap. Yesterday, I pottered and cleaned and then proceeded to take a 2 hour nap (fine, it was sleeping!). When I woke up, The Boy was still prepping all the crazy elements to his two dishes. It seemed to me that dinner preparations was going to be looked after by me. After a quick discussion, we decided that we would put the Bellini to the Hainanese Chicken Rice (thermal cooking machine) test. 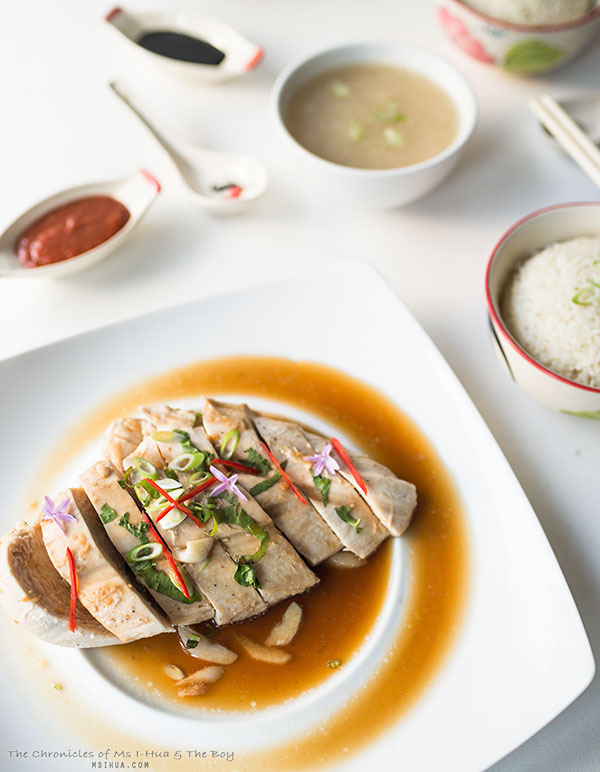 Cooking Hainanese Chicken Rice through the normal traditional way of poaching is usually a 2 hour process. Too long! After a long day doing housework or coming home from work, spending two hours slaving behind the cooktop is just a big no-no. Unless of course, you have the time and would like to do it for me :P.
Using a thermal cooking machine, the time is cut down to almost a quarter of that! Unbelievable. I have to be honest with you. I was so surprised and amazed with how the dish turned out that I had to apologise to Bellefleur for being so sceptical! In a separate bowl, mix 2 teaspoon of Shaoxing wine, 1/2 teaspoon of sesame oil, pinch of salt and pepper, before rubbing onto the chicken breast. Add in 1 roughly chopped half of the garlic clove and three batons of the spring onion and set aside. Attach chopping blade into the jar. Add 3 out of the 4 halves of the garlic cloves, 2 shallots, remaining baton of the spring onion, and ginger into the jar (speed 6/ 1 min). Add the oil through the lid and sauté the ingredients (speed 2/ 80 degrees Celsius/ 3 minutes). Add in the rice, a sprinkle of salt and fry (speed 2/ 100 degrees Celsius/ 2 minutes). Remove the rice from the jar and into the cooking basket*. Add into the jar, the chicken stock before placing the basket into it. Cover with the lid and Vapore deep steam tray attachment (speed 1/ 125 degrees Celsius/ 5 minutes). After 5 minutes, place the chicken breast onto the Vapore deep steam tray and continue cooking (speed 1/ 125 degrees Celsius/ 15 minutes). Once the chicken has cooked, remove from the Vapore (becareful of hot vapour). Slice chicken and place onto a serving plate. 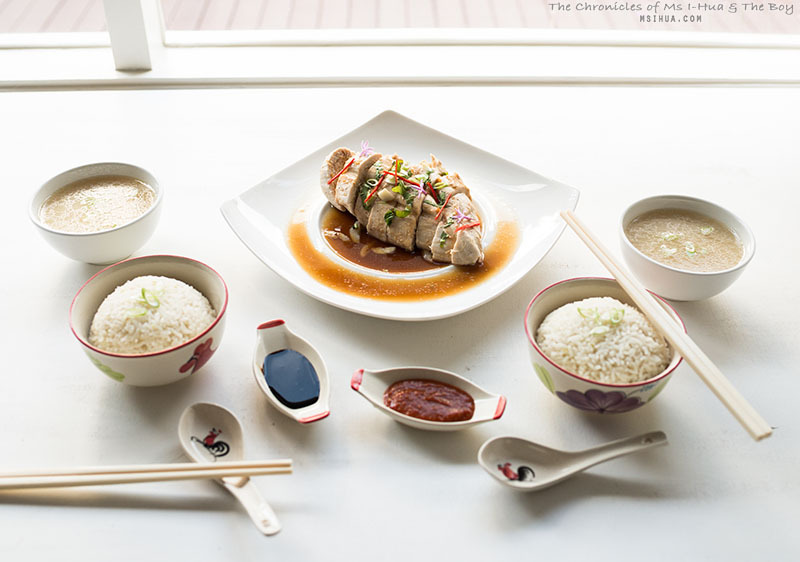 To make a quick sauce, mix together 2 teaspoons of light soy sauce, 1/2 teaspoon of sesame oil, 2 tablespoons of leftover chicken broth (from the jar), 1/2 teaspoon of sugar and drizzle on top of the sliced chicken. Garnish with coriander, chillies and spring onion. Remove rice from the cooking basket and into a serving bowl. For the soup, mix the left over chicken stock in the jar and steaming juices from the condensation catcher together with a teaspoon of light soy sauce and pour into soup bowls. 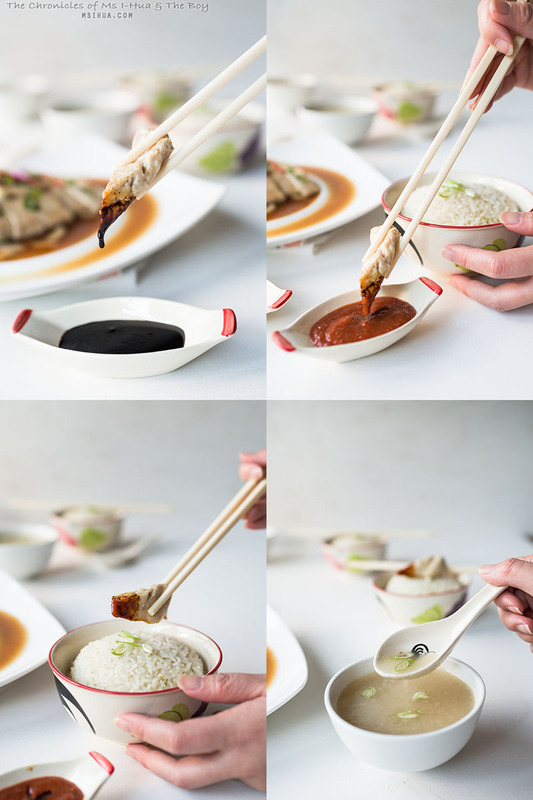 Serve your dish with some Hainanese Chicken Rice chilli sauce and thick dark soy sauce (optional). One of the things we have not quite worked out yet is the timing of steaming protein, as each different type and size/weight of meat will require slightly different steaming times. We originally steamed the chicken breast for 20 minutes (together with the rice, without pause) and found that though the chicken was cooked, it was slightly over. Hence, the slightly modified times and instructions above. We’ll try this again and fix up the timing, once we are 100% comfortable with it. As part of Target’s ‘Massive Home Sale’ the Bellini Super Cook Kitchen Machine will be on special via Target’s online store only, from 12 March 2015 for $699. Free Delivery (always a bonus). Get in quick as the sale ends 25 March 2015! Click here to find out more. Wahhhhh looks so yummy!! 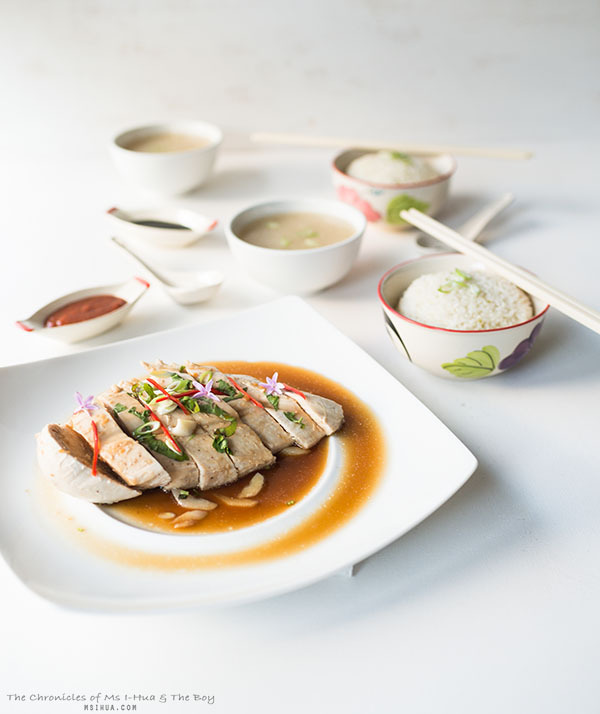 I love Hainanese chicken rice, I could eat this for “brunch” every day. p/s: love your oriental serving ware! You guys are both creative and sound like having fun together! Another great creation, congratulations! !